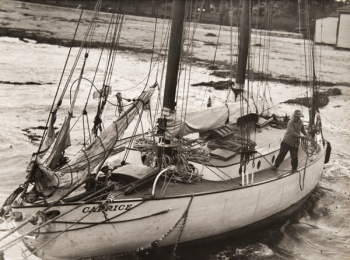 Caprice (#none) (1906-1925), a 66-foot two-masted oak-framed center-board schooner with 2500 square feet of sails, built in 1906 in San Francisco. 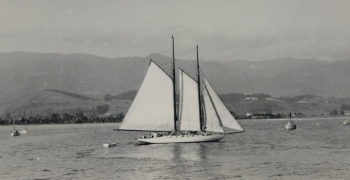 In 1919 a syndicate was formed to purchase her for the Santa Barbara Yacht Club’s flagship. Described as the “darling of the channel,” she was brought to Santa Barbara from San Francisco July 18, 1919 by Captain Edward Gourley. 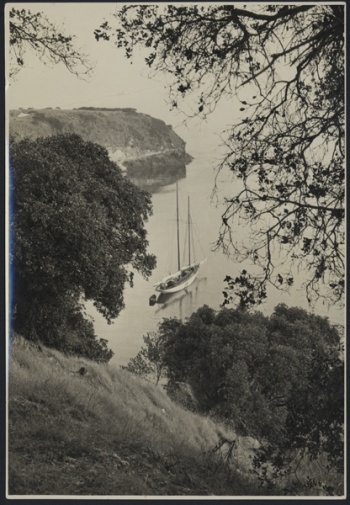 In 1921 the syndicate members assigned their interests in the vessel to the club “in return for 10 years paid up memberships.” In 1922 Caprice participated in an expedition of 250 prominent Santa Barbara citizens to Santa Cruz Island to promote the idea of a harbor in Santa Barbara. Captain Gourley estimated that over the years he took between 25,000 and 30,000 persons aboard Captice on cruises across the channel. In 1925, Caprice caught fire in mid-channel when a 15-gallon leaking tank of gas exploded, and she sank. Captain Ed Gourley and his crew of eleven men escaped in two lifeboats and rowed seven hours to Pelican Bay on Santa Cruz Island. Captain Ira Eaton’s powerboat Sea Wolf returned them to Santa Barbara the next day. This page was last edited on 25 January 2019, at 11:43.